The first production YS-11 flew on October 23, 1964 and was delivered on March 30, 1965, with initial airline operations by Toa Airways beginning in April 1965. At first, deliveries were mainly to Japanese airlines, and NAMC developed the YS-11A, with higher gross weight, to make the aircraft more attractive to the North American market, and in particular to meet the requirements of Piedmont Airlines, which ordered ten YS-11A-200s, with an option for an additional ten aircraft. Orders slowed after the needs of the Japanese commuter airlines for which it had been designed were met. This, together with losses growing to $600 million, resulted in production being stopped after completion of 182 aircraft, with the last YS-11 being delivered to the Japanese Maritime Self-Defence Force on May 11, 1973. The YS-11 was slowly phased out by airlines in Japan due to new directives issued by the Ministry of Land, Infrastructure, Transport and Tourism requiring all commercial aircraft in Japan to be fitted with a Traffic Collision Avoidance System (TCAS). Aircraft without TCAS were forced to cease operations at the end of 2006. Since equipping a YS-11 with TCAS would have cost ¥100 million (about US$1 million), a refit was deemed economically unsound. Aircraft still in flying condition were sold to foreign companies. On September 30, 2006, Japan Air Commuter Flight 3806 marked the final flight for a YS-11 in Japan's commercial aviation industry. In 2007, the YS-11 was added to the Mechanical Engineering Heritage of Japan as item number 13. As of 2014, 15 are operated by the Japanese military, and two in Mexico. The versions supplied to the Japanese military are the 'Super YS' with uprated engines. Current planes are mostly in a very boring two color grey scheme. These aircraft replaced the EC-46s that were used for the same task. As I mentioned in an earlier preview of this aircraft, this is one of those kits that often flies under the radar of most modelers, and it is a shame as it builds into an excellent model. I've built the ANA airliner version and found it to be well thought out. Hasegawa includes the nose weights and a holder to keep them from rattling around. 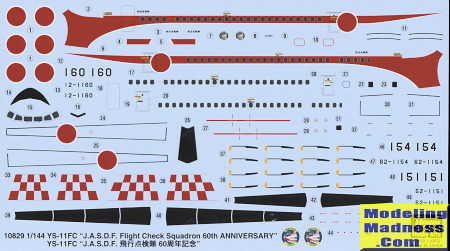 Unlike many kits, this one comes with a display stand, for which a hole will need to be opened in the fuselage halves prior to construction. There is a cockpit of sort with simply some seats molded to a forward section. It is to the back of this section that the weights are attached in a small cage made specifically for this purpose. There are no windows molded on the fuselage to allow the kit to be used for a variety of airlines and military liveries. Engines are each three pieces and hold poly-caps for the props. Wings are an upper and lower section on each sied and include a rudimentary wheel well. The engine nacelles simply slide onto the front of the wing. One can build the airplane in flight and separate closed gear door assemblies are provided for this. A display stand is included for this option. Those wishing the plane on its wheels have nicely molded gear on which to place the airplane. The last thing one does is insert the windscreen and the props. 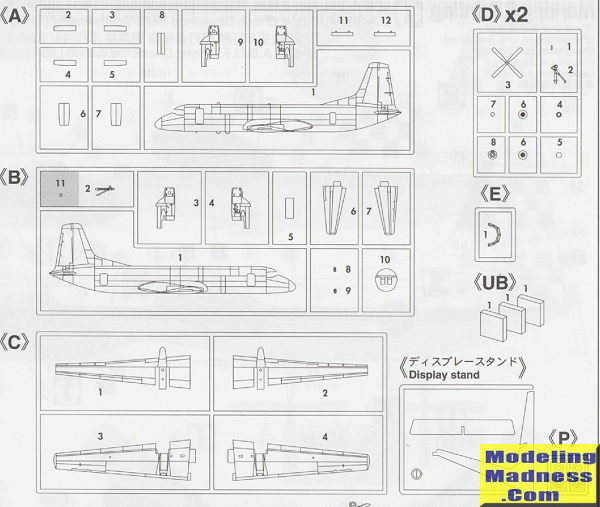 In structions show that this is pretty much the standard airliner and the only hole you might have to open is the one for the display stand. There is the usual Gunze paint reference and two markings options are provided. These differ only in the serial number and in the lack of a fin de-icer boot in the other. A third set if serial numbers is included but not shown. It also does not have the de-icer boot according to photos on the 'net. As usual, the decal sheet is quite well done and provides the large cheat stripe on the side so you won't have to paint it. The sheet includes wing walk markings, de-icing boots and even prop decals. It is superbly printed and should work as well as any aftermarket sheet. All three planes are white over what is listed as aircraft grey. This shade is generally FS 16473, ADC Grey. Another very nice kit of a plane many have either never heard of or that hasn't drawn their interest. A shame as it is a neat looking aircraft. For those interested, the box art plane is still in service though many have been retired.